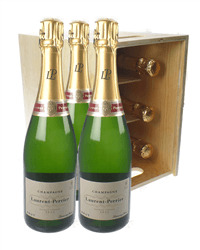 Send a crate of Laurent Perrier Champagne to celebrate in style. Our six bottle Laurent Perrier Champagne wooden crates can also be supplied with six flutes so you can celebrate any occasion anywhere. Order online or by phone and we will send your gift, carefully packaged, with your special gift message.